Super-resolution1 techniques have enabled researchers to perform imaging below the classical diffraction-limit of light with thus far unprecedented precision. In single-molecule localization implementations, molecules are 'switched' between non-fluorescent dark- (or OFF-) and fluorescent bright-states (or ON-states) in order to assign and detect their position with sub-diffraction precision. By acquiring not only one, but rather a whole stack of images, in which only a random subset of fluorescent molecules (which differs from frame to frame) are recorded in the "ON-state", a super-resolved image can be constructed. The recently introduced super-resolution method DNAPAINT2 is based on transient DNA-DNA interactions. Compared to other stochastic approaches such as STORM3, PALM4, or GSDIM5 the fluorescence molecules aren't switched between dark and bright states, but the so-called "blinking" in DNA-PAINT is created by transient hybridization (binding and unbinding) of short fluorescent DNA strands (imagers) to their targets (figure 1a). Oncethe imager is bound to the docking site, the fluorophore is immobilized and can be detected by a camera. DNAPAINT does not suffer from photobleaching as the imager strands are dynamically replenished. This allows the extraction of the full photon capacity of an immobilized imager strand upon binding to the docking site, facilitating superior resolution down to a few nanometers6. The high signal-to-background ratio enables the combination of DNA-PAINT and confocal approaches, such as spinning disc confocal microscopy7. We assayed a new non-cooled scientific CMOS camera (pco.panda 4.2) with synthetic DNA nanostructures. Therefore, we decorated a flat rectangle DNA origami with DNA-PAINT docking sites in a grid pattern with 10 nm spacing (figure 1b) and imaged the surface-bound structures using total internal reflection fluorescence8 (TIRF) microscopy. Individual docking sites could be localized with a precision of around 1.5 nm, translating to a remarkable FWHM-resolution ~3.6 nm (Figure 1c). 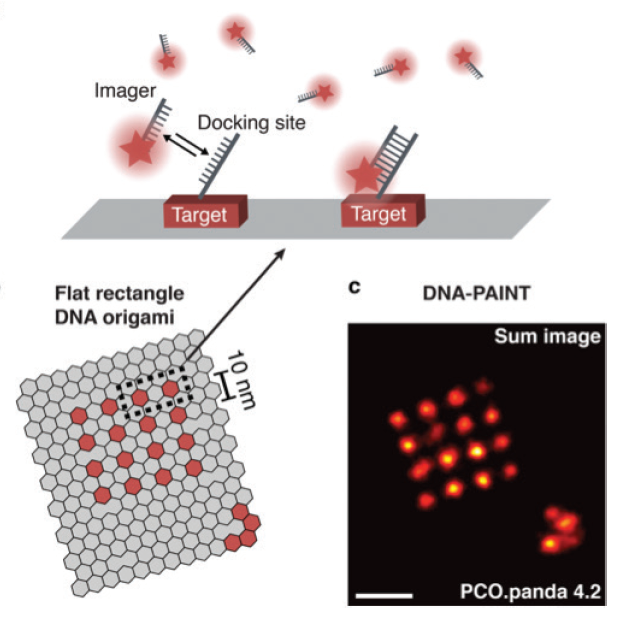 Figure 1: DNA-PAINT imaging of DNA origami. (a) DNA-PAINT principle: Short oligonucleotides functionalized with ‑ uorescent dyes bind transiently to complementary DNA strands (docking site) localized at the target. (b) Flat rectangle DNA origami decorated for DNA-PAINT imaging with a 4 x 4 grid pattern, spacing 10 nm. (c) Sum image of n = 24 DNA origami imaged with DNA-PAINT and the sCMOS camera (pco. panda 4.2). Scale bar: 20 nm (a). Due to the programmable nature DNA interactions in DNA-PAINT, multicolor image acquisition is not limited to spectral multiplexing. The DNA sequence of the imager strand can serve as a pseudo-color, where every orthogonal sequence represents a unique color. This enables multiplexed imaging using the same best-performing fluorescent dye, in a method called exchange-PAINT9. Image acquisition is then performed sequentially. The transiently binding imager strands can be removed using washing buffer and the new ‘color' (e.g. imagers with a different sequence) can be introduced. Figure 2: DNA-PAINT imaging in a cellular environment. (a) Microtubules are labeled with alpha tubulin primary antibodies and DNA-conjugated secondary antibodies. Imaging was performed in TIRF mode with an uncooled sCMOS camera (pco.panda 4.2). (b) Diffraction-limited (DL) representation and (c) super-resolution (SR) zoom-in of the highlighted area in a. (d) Cross-sectional histogram of the area marked in (c) shows the distances between three microtubule ­ laments. Scale bars: 5 µm (a), 500 nm (b, c). To image cellular components with DNA-PAINT, labeling probes (for example antibodies10, anobodies11 or Affimers12) were conjugated with short DNA oligonucleotides serving as the docking site. We investigated the imaging capability of a non-cooled sCMOS camera in a cellular environment of a fixed COS7 cell, where alpha tubulin was labeled with primary and secondary antibody (figure 2). The overview (figure 2a) shows the super-resolved microtubule network. Comparison of the diffraction-limited zoom-in panel in figure 2b with the super-resolved zoom-in figure 2c clearly displays the increase in resolution, allowing the discrimination and the distance measurement (figure 2d) between individual tubulin filaments. Clearly a non-cooled sCMOS camera is well suited to do these kind of super resolution measurements with the DNA-PAINT method. 1. Hell, S.W., et al., The 2015 super-resolution microscopy roadmap. Journal of Physics D-Applied Physics, 2015. 48(44). 2. Jungmann, R., et al., Single-molecule kinetics and super-resolution microscopy by fluorescence imaging of transient binding on DNA origami. Nano Lett, 2010. 10(11): p. 4756-61. 3. Rust, M.J., M. Bates, and X.W. Zhuang, Sub-diffraction-limit imaging by stochastic optical reconstruction microscopy (STORM). Nature Methods, 2006. 3(10): p. 793-795. 4. 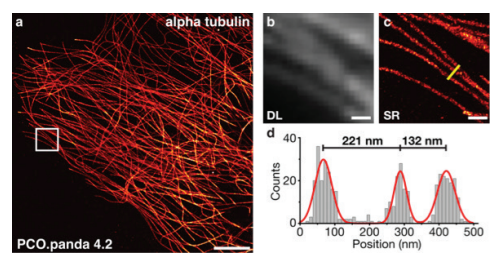 Betzig, E., et al., Imaging intracellular fluorescent proteins at nanometer resolution. Science, 2006. 313(5793): p. 1642-1645. 5. Fölling, J., et al., Fluorescence nanoscopy by ground-state depletion and single-molecule return. Nat Methods 5 (2008), p. 943-945. 6. Dai, M., DNA-PAINT Super-Resolution Imaging for Nucleic Acid Nanostructures. Methods Mol Biol, 2017. 1500: p. 185-202. 7. Schueder, F., et al., Multiplexed 3D super-resolution imaging of whole cells using spinning disk confocal microscopy and DNA-PAINT. Nat Commun, 2017. 8(1): p. 2090. 8. Axelrod, D., Cell-substrate contacts illuminated by total internal reflection fluorescence. J Cell Biol, 1981. 89(1): p. 141-5. 9. Jungmann, R., et al., Multiplexed 3D cellular super-resolution imaging with DNAPAINT and Exchange-PAINT. Nat Methods, 2014. 11(3): p. 313-8. 10. Schnitzbauer, J., et al., Super-resolution microscopy with DNA-PAINT. NatProtoc, 2017. 12(6): p. 1198-1228. 11. Agasti, S.S., et al., DNA-barcoded labeling probes for highly multiplexed Exchange-PAINT imaging. Chem Sci, 2017. 8(4): p. 3080-3091. 12. Schlichthaerle, T., et al., Site-specific labeling of Affimers for DNA-PAINT microscopy. Angew Chem Int Ed Engl, 2018.